Plastic bath repairs are relatively easy to make whether the damage item in questions, scratched, cracked or discoloring to your bath tub. Plastic bath tubs repaired situ on site or in your home at a time that suits you, depending on how bad the damage is it usually takes on average between 2-3 hours to complete the process. All repairs are color matched on site using a pure white and adding tints in small doses until the correct colours achieved. Baths are so important to a bathroom as it is the main feature of the room taking up the majority of space and in some instances making a statement of desirability. Damaged bath tub can be a real pain in the bum, especially when the damage is in the wrong place. It can be an eyesore and ruin the overall feel of a bath room. This is why often people are so inclined to have a minor piece of damage repaired and give them selves piece of mind. 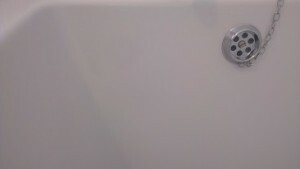 Please click the link if you would like to view other types of bath repairs and bath resurfacing we carry out on site. Plastic baths can be cracked with relative ease when enough pressures applied to a large area, the plastics elastic strength goes beyond its limit and results in a large surface crack. As pictured above, the cracked plastic bath was damaged by a tradesmen plumbing in the bath. Cracks to a plastic bath tub are drilled at the ends of the cracks to avoid the damage progressing any further through the molded plastic. Repairing cracks in a plastic bath tub require patching from the back of the surface with a flexible carbon fiber filler. Our carbon filler ensures that the repaired area is stronger then the original remaining both flexible and strong. The area around the crack must then be filled and coated with a specialist bath tub coating. Chips to a plastic bath surface is created when hit with a high impact blow from an object with a small area. These types of damages renders the plastic inflexible and in effect makes the surface hard upon impact, which is not an ideal situation for plastic. The most common things that create chips are falling tiles, hand tools and household toiletry bottles. Plastic used to manufacture baths is relatively brittle to begin with. Harsh cleaning chemicals are used during cleaning by unknowing owners, harsh chemicals such as bleach and citric acid are common in household bathrooms. Even in small doses over time they damage the surface of the baths plastic coating resulting in micro fractures on the surface, this can make the surface appear yellow or brown. Acrylic coating is a very soft material and because of this acrylic tends wear after time from daily use and general wear and tear, they look dull as the surface coat becomes thinner eventually exposing the softer layer beneath the top coating, strong house hold cleaners can also remove the surface layers of the top protective coating and discoloring from sunlight and bleach can be big problem too. Plastic tubs are more prone to damage when having items dropped or into them and from great heights this can cause great damage to the baths surface, we often see Plastic tubs in need of repair. 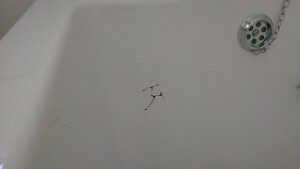 A great example is when there is a shower fitted with-in the bath, shower heads often get dropped when the user has taking a shower or cleaning, over time the bath becomes damaged. We often make a Plastic Bath Repair and bathroom repairs for tilers dropping a tile into the bath and chipping the surface or builders and plumbers dropping tools and materials into the bath. With our team of professionals they are able to create an exact color match of your bath on site or in your home using our advanced coating systems used for plastic bath repair so it will blend in with the surrounding area. Using specialized hardened fillers we can profile the repair making look amazing and giving your old tub many more years of use to you and saving you masses of money.